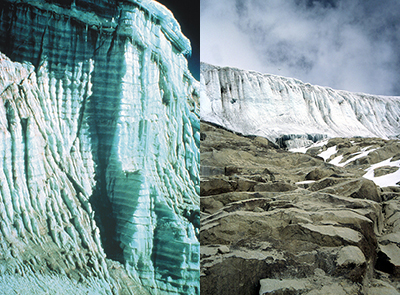 These photos of Quelccaya Ice Cap in Peru, taken from the same spot in 1977 (left) and 2002 (right) show the retreat of the ice cap's vertical margins. The 1977 image shows the annually deposited layers of ice and dust that make ice cores drilled from the site especially useful to scientists. Photos by Lonnie Thompson, courtesy of Ohio State University. COLUMBUS, Ohio—Two annually dated ice cores drawn from the tropical Peruvian Andes reveal Earth’s tropical climate history in unprecedented detail—year by year, for nearly 1,800 years. Researchers at The Ohio State University retrieved the cores from a Peruvian ice cap in 2003, and then noticed some startling similarities to other ice cores that they had retrieved from Tibet and the Himalayas. Patterns in the chemical composition of certain layers matched up, even though the cores were taken from opposite sides of the planet. They are also special because of where they formed, atop the high Andean altiplano in southern Peru. Most of the moisture in the area comes from the east, in snowstorms fueled by moist air rising from the Amazon Basin. But the ice core-derived climate records from the Andes are also impacted from the west—specifically by El Niño, a temporary change in climate, which is driven by sea surface temperatures in the tropical Pacific. 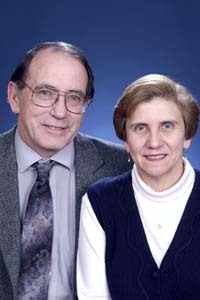 Ellen Mosley-Thompson, distinguished university professor of geography at Ohio State and director of the university's Byrd Polar Research Center, explained that the 2003 expedition to Quelccaya was the culmination of 20 years of work. The Thompsons have drilled ice cores from glaciers atop the most remote areas of the planet—the Chinese Himalayas, the Tibetan Plateau, Kilimanjaro in Africa, and Papua Indonesia among others—to gauge Earth’s past climate. Each new core has provided a piece of the puzzle, as the researchers measured the concentrations of key chemicals preserved in thousands of years of accumulated ice. “The frozen history from this tropical ice cap—which is melting away as Earth continues to warm—is archived in freezers at -30ºC so that creative people will have access to it 20 years from now, using instruments and techniques that don’t even exist today,” he said. Editor’s note: Lonnie Thompson will be on travel from Saturday, March 30 until Thursday, April 4. During that time, he can be reached through Pam Frost Gorder.